Grant Challenger Series Steering Wheels feature Grant's exclusive dual-plane 4 spoke design offering a classic look with a modern twist. 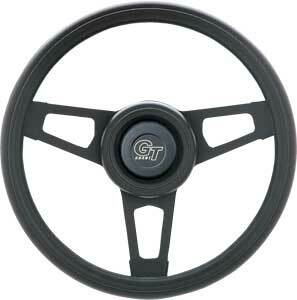 Challenger Steering Wheels have an extra thick textured foam cushion grip and CRS steel spokes. Mounting is a breeze with Grant's wheel install kits to accommodate Challenger Series Wheels. Available in many different color options, you can rest easy knowing you're going to make the right choice with Grant Challenger Series Steering Wheels! 870 is rated 5.0 out of 5 by 1. Rated 5 out of 5 by Uncle Stymie from Awesome wheel Great steering wheel, great super fast shipping, Jegs is the best ! !